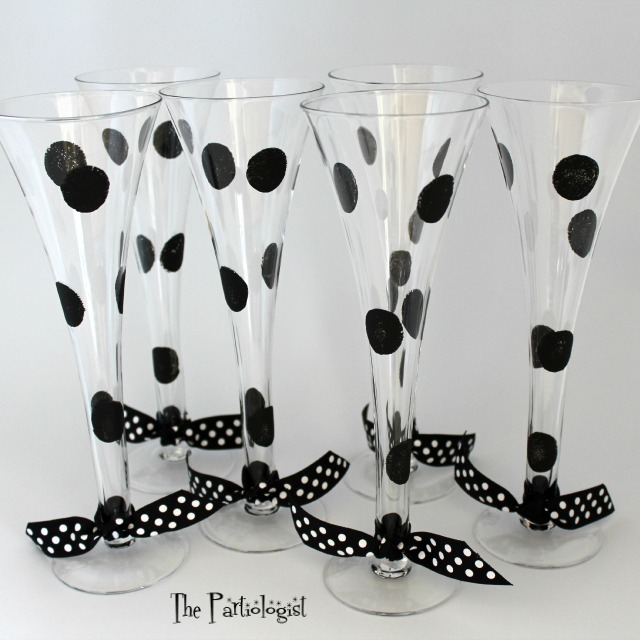 The Partiologist: DIY Polka Dot Glasses & Mugs! 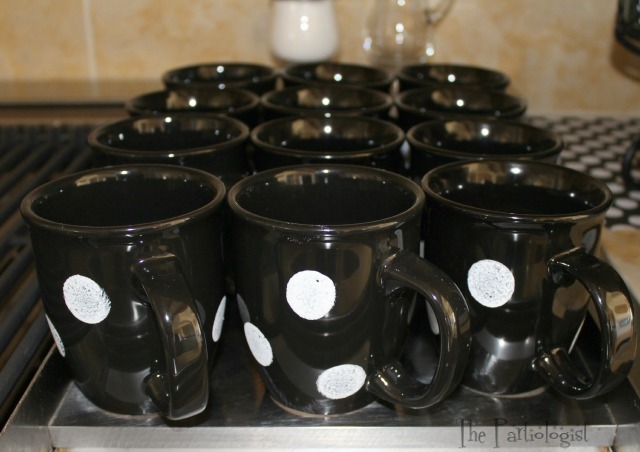 DIY Polka Dot Glasses & Mugs! You've got polka dots and stripes in your future if you click on this post. 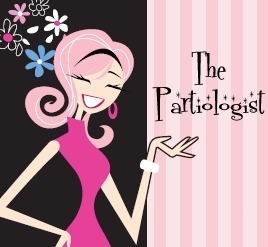 Today is the last of the polka dot party. I wanted to make sure my stemware and mugs were part of the décor. I loved that they coordinated with the theme and when the party was over, they could be washed and ready for the next event. I've got dots more for you to see! 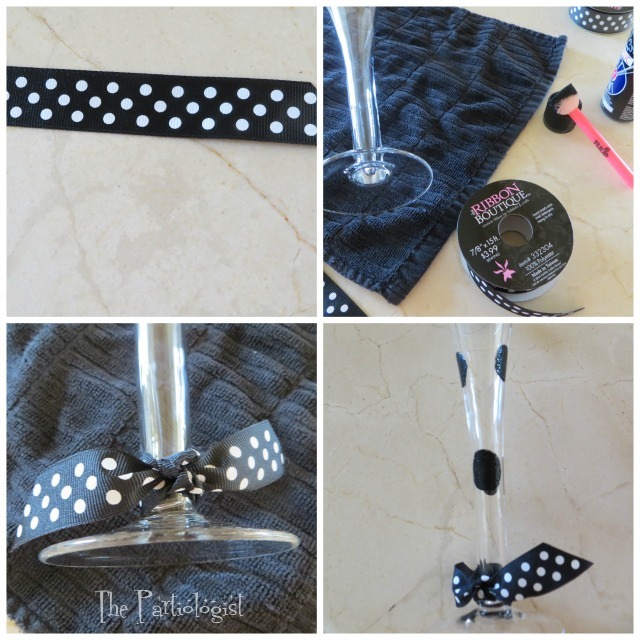 Wrapping a napkin around the base of the wine glass and tying with a ribbon was the easiest way of incorporating the dot theme with the glasses. 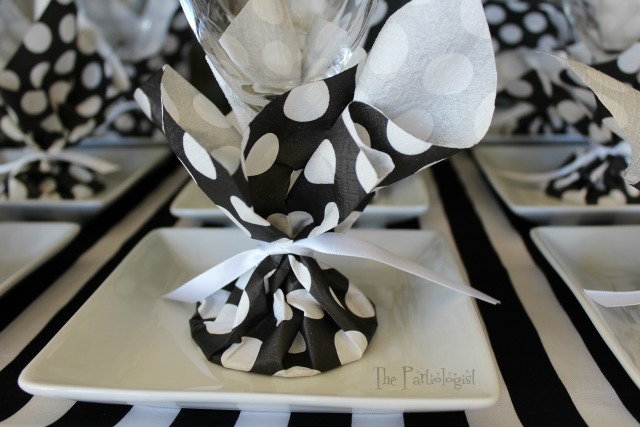 The glasses were placed on small white plates with striped fabric below. Now for the painted stemware. 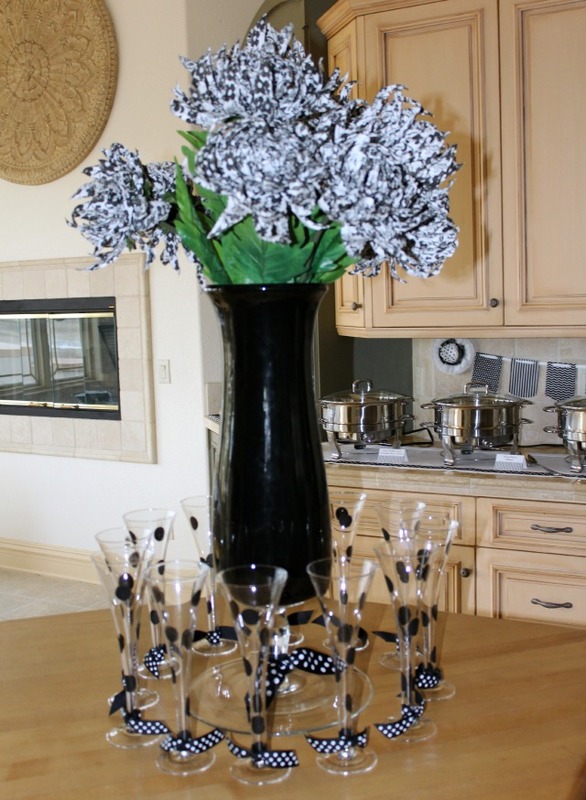 After painting the champagne flutes, I tied a polka dot ribbon around the stem. So easy, a child could help, but don't let them because they would probably break the champagne flute. Some child broke one of mine while washing... oh wait, that was me. 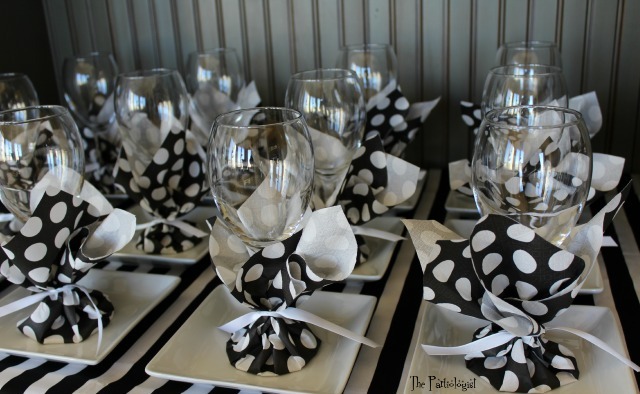 Here's how to turn your stemware into WOW ware! 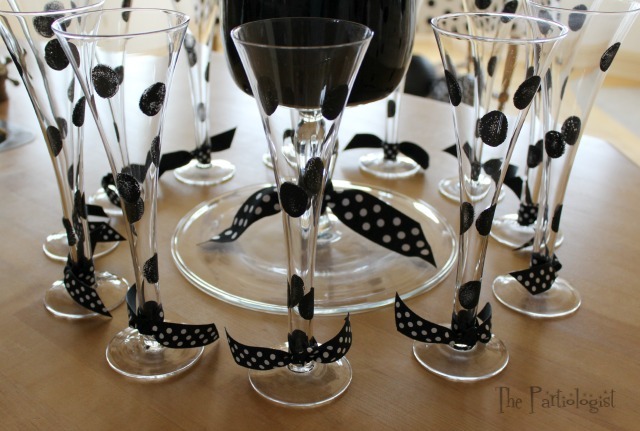 Grab polka dot ribbon and tie around the bottom of the glass. Using black acrylic paint and a round sponge paint brush, dip and dot. Which means dip your brush in the paint and dot your glasses. Perfectly coordinating with the paper flowers (vase and flowers purchased at Hobby Lobby). Soon they became part of the centerpiece. Notice, I elevated the vase by turning a glass cake plate upside down. After having so much fun dotting my stemware, I started dotting my mugs. Using the same method, this time with white paint. 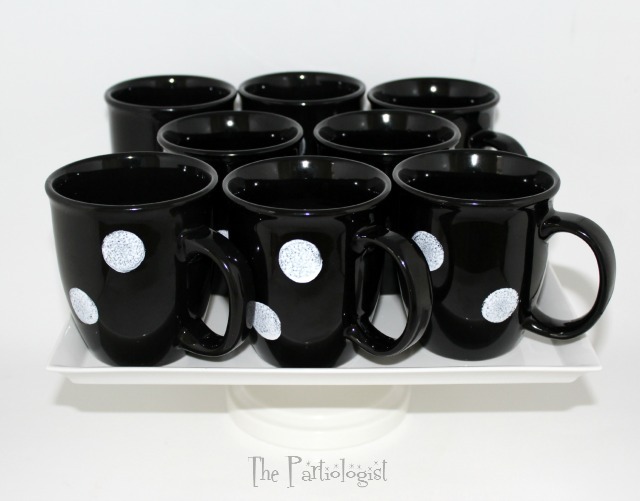 The mugs were part of the party in no time! I do hope you enjoyed the party and always come back for more. Great job Kim. You always come up with such cute themes. Is the paint washable off the glasses? Such a cute idea. 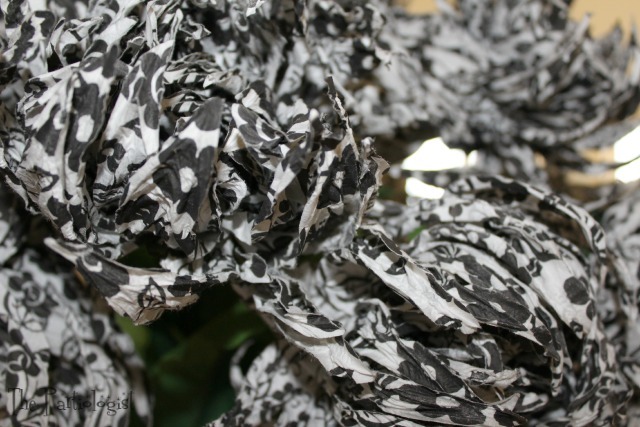 What about the black and white flowers? Did I miss how you came up with them? Please share if you can. Thank you so much for all you do.